I began making the mosaic background for this card by randomly cutting snippets of retired SU! dsp into odd shapes and sizes. I took a piece of plain white cardstock and ran it through my Zyron to cover it all with adhesive. I placed the snippets down all over, leaving gaps between pieces. After the snippets were placed, I covered the entire piece with gold embossing powder and heat-set it giving the mosaic effect. Once I trimmed the piece down, I embossed it with a We R Memory Keepers next generation "gemstones" ef to add more texture. The Gina Marie Designs die-cut angel and word "Blessings" were both done with the inside of a paper pad cover and the word "Christmas" (by SU!) was gold embossed on a piece of white card and hand-cut to fit the card. I placed this all on a kraft card base. Thanks so much for stopping by and I wish you a great day! A fabulous card Jane, such a beautiful mosaic background and pretty Angel. You are surely "the snippets Queen", my friend! :D I think that Di will give you an award :) (but good luck for the challenge draw! )Your background is just stunning, how many pieces and the gold heat embossing plus the cold one make it precious and very texturized! The angel diecut is so beautiful and elegant! Very well done! Oh my goodness this is so lovely! well done on the use of a mega amount of snippets and creating such an effective card. I have seen you do this before and I just love this technique. Gorgeous card! That background is really spectacular! I bow down to your superiority when it comes to snippets and left overs. This is such a fabulous technique Carol - I think I made you a weekly/fortnightly pick on a previous entry as it's such a super way to use up little snippets. LOVE it - clever you! what a very wonderful card and your design is brilliant. Thanks for joining the Rudolf Challenge. I love the background you made with the snippets of pattern papers. And, adding the gold between really made it so extra elegant looking. Great background for those lovely dies. What a cool background! You are the Queen of using those tiny scraps and making them into master pieces. Love the Gold. This is a lovely card, CArol. Great for my challenge and oh so perfect for Di's! What a fabulous use of snippets on your background!!! Thanks for taking part in the November Rudolph Days Challenge. 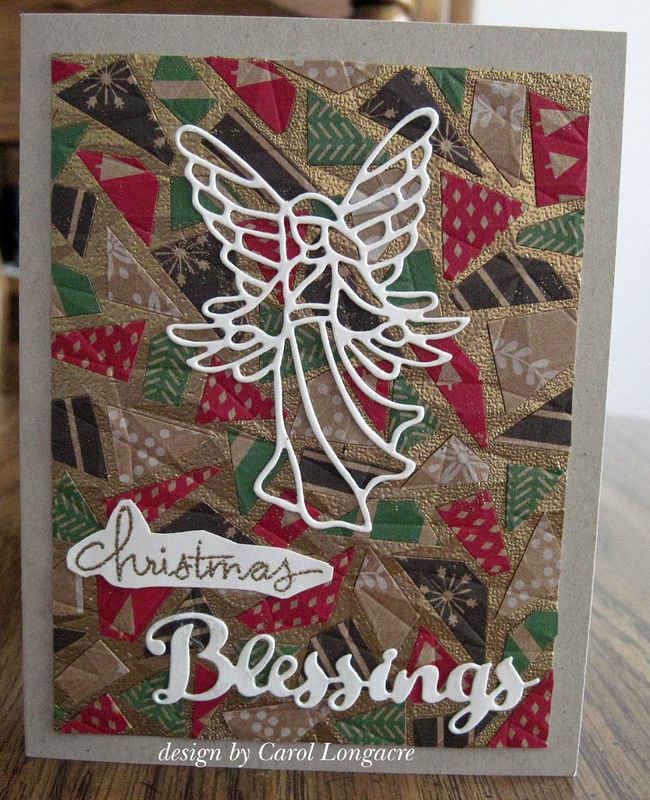 I love this card Carol, the beautiful white die cut angel looks great on your lovely mosaic background. A very beautiful card. The white die cuts look amazing on the pretty background paper.